NANPING, Fujian - Classes resumed on Wednesday at a local primary school where a man stabbed eight children to death on Tuesday, but some shocked students remained at home, while psychologists try to help traumatized students process their pain. At 7 am, many students arrived, escorted by family members, and began to enter the Nanping Experimental Primary School. Previously, the gate opened at 7:30 am sharp and pupils who arrived early had to wait outside. "If the children had been allowed to enter the school grounds upon their arrival, before the school's opening time, the tragedy might have been averted, or at least have resulted in fewer deaths," said Jiang Wenming. He burnt incense on the site in memory of first-grader Chen Chuning of his family. The 9-year-old girl died in the killing spree, which happened at 7:20 am on Tuesday. She was among the other young victims who crowded outside the school gate waiting to be allowed inside, Jiang told China Daily on Wednesday. Five other children were injured in the attack. Young witnesses who survived the incident were struggling with the trauma, relatives said. "My 10-year-old granddaughter cannot forget the scene when her schoolmates fell down in blood right in front of her. She refused to come to class today no matter what," said an elderly woman, who declined to be named. To help address the trauma, school authorities dispatched teachers to the gate to welcome students. At 8:12 am, more than 2,000 students and members of the school faculty presented white flowers to the victims' families. 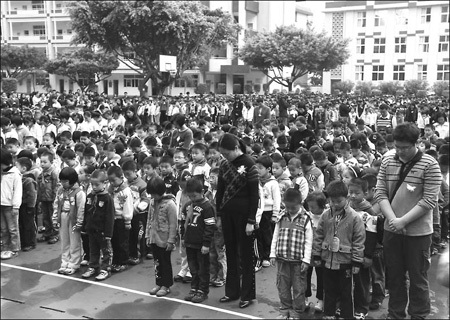 School officials arranged for professional psychologists from various parts of Fujian to visit each class, to talk to students and show them how to cope with the negative impact and stress of the attacks. Xiong Fuxian, a psychiatrist with a local hospital, said the mental health interventions were carried out in varied forms according to the students' needs. For the younger ones, who are more resilient, games were organized to bring them happiness and a sense of safety under sound protection, he said. Face-to-face talking, coupled with affirmative patting and touching, is more helpful for older students to shake off the sadness and shock, he said. "But they (the older ones) definitely need more time to recover. Mounting negative emotions will impact their health," he said. Flowers were placed on the vacant desks of the deceased. "We'll always protect you and don't be afraid," teachers told the students through loudspeakers. Teachers then gave each student a warm hug. "It's my first experience (with this kind of violence) in my 30-year teaching career. I feel so sad seeing so many young lives pass away," said a teacher surnamed Shi. In the intensive care unit of Nanping No 1 Hospital, the five wounded were struggling to survive. To help with their treatment, the Ministry of Health has sent experts from Beijing. The Procuratorate of Yanping district in Nanping approved the arrest of Zheng Minsheng on Wednesday afternoon on charges of intentional homicide, reported Xinhua News Agency, citing Ye Xianjin, director of the Yanping district procuratorate office as saying. Zheng, who reportedly had a history of mental illness, worked as doctor at a local community clinic for six years, starting in 2002. He resigned for personal reasons in 2009, reported Xinhua. However, some local reports said he was fired because of his mental instability. Former colleagues at the clinic told China Youth Daily they had not known that Zheng had ever suffered from any mental problems. "He was nice then and usually prescribed cheap drugs," said one of his former patients. He had no apartment under his name and lived with his mother and elder brother's family of three in an apartment measuring 60 square meters, the paper reported on Wednesday. He slept in the living room, said one of the neighbors. At 42, with no career, house, or marriage, Zheng was kind of marginalized in society, said a neighbor. "Mired in desperation, people like Zheng would be very likely to do such extreme things. They need more care," he said. On a snowy Sunday afternoon, Ji Ruguang stood between a dozen people and a three-story building. China National Petroleum Corp and Royal Dutch Shell Plc plan to jointly develop and produce natural gas in China's Sichuan Basin. Angelina Jolie films a scene where she drives a boat down the canal. Sometimes celebs themselves even don't know what are they talking about. Chinese cities are ugly.They build skyscrapers everywhere, without any proper city plan.